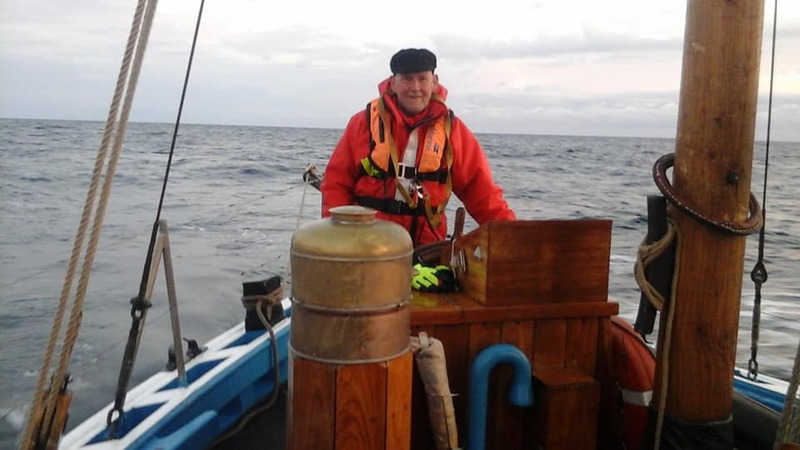 Bob Clunas was invited to sail on the The Swan, from Lerwick, Shetland to Ålesund, Norway. 4 -10th August, seven days sailing and 340 nautical miles. 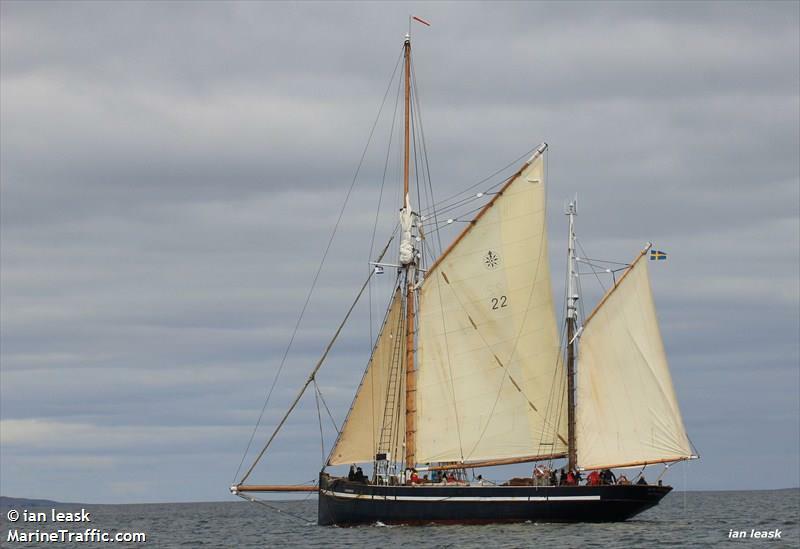 Bob will be going back in September to sail her from the Lofotens back to Shetland . Wish him 'fair winds and rolling home'. August 6, 2018: Dunbar’s lifeboat crew rescued a German yacht owner whose engine failed early-morning. The yacht Optimist B became stranded without power or wind a mile north of Torness Power Station. The all weather lifeboat (ALB) was launched from its mooring at Torness at 7.07am and within a few minutes had reached the yacht. 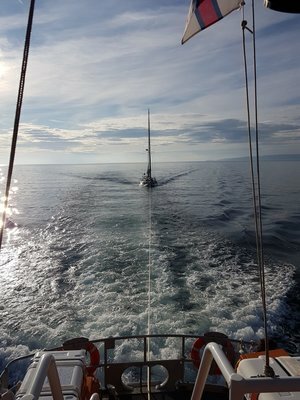 The 74-year-old skipper of the 40ft yacht had been sailing single-handedly from Dusseldorf around the UK since May and was on passage to Port Edgar on the Firth of Forth when he suffered technical difficulties. 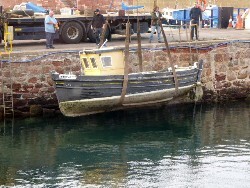 After assessing the situation, the lifeboat crew set up a tow to Dunbar Harbour for repairs. Everyone was welcome to the Dunbar Battery for an afternoon of Irish Dancing. The children were astonishing and later some parents were invited to ‘have a go’. This was a fundraiser to assist with costs of sending some dancers to the World Championships in Holland next year. Earth and rubble has been moved from above the Maggie-area, taken over the bridge and disposed off near the breakwater. Also the DHT are looking to make improvements to the area behind the Fisherman's Stores to create better access and new workshops and garage area for the forklift, as well as reinstating the seating-area below the Castle. Plans are being developed for Planning and funding applications with the project hopefully on site early in the new year. 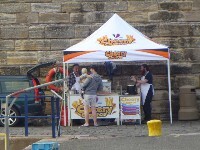 Cheery Churros set up on Aug 14th, next to Big Blue and The Fizz Bar. ‘Jenny Le’ a new arrival in the harbour, just been craned in; apparently a pleasure vessel being refitted by a person from east Linton. Some work to do! Pix in the Stix: As the summer draws to a close and the nights get darker, what better way to celebrate a successful summer of events than an outdoor cinema showing at the Dunbar Battery. Bring picnic blankets, popcorn and thermos as we welcome Pix in The Stix and their viewing of 'The Greatest Showman' on evening of 22nd September. Alex Cornish Gig, September 6, 2018 at 6:30 pm to 8:00 pm. 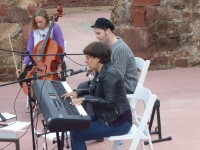 More live music at the Dunbar Battery as we welcome Alex Cornish. Alex is a local, highly accomplished recording artist and we’re delighted he has agreed to play Until the Traffic Stops: “A beautifully orchestrated album of rich, dark, ethereal singer-songwriting that evokes the 21st century soundscapes of Radiohead” – The Telegraph. 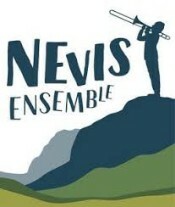 Free show – donations welcome.